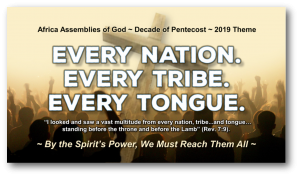 On Pentecost Day, 2010, the Africa Assemblies of God Alliance (AAGA) launched the “Decade of Pentecost” (2010-2020). During this decade AAGA is believing God for 10 million new believers to be baptized in the Holy Spirit and mobilized as Spirit-empowered witnesses, church planters, and cross-cultural missionaries. 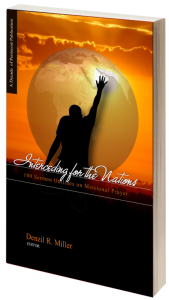 AAGA believes that this outpouring of the Spirit will result in thousands of new churches being planted, and hundreds of indigenous missionaries being recruited and deployed. Also, during the Decade of Pentecost, AAGA hopes to reach the more than 800 yet-to-be-reached tribes of sub-Sahara Africa and the Indian Ocean Basin. The Acts in Africa Initiative has been given the responsibility of leading the Decade of Pentecost emphasis. Acts in Africa website: Click here. Decade of Pentecost Goals: Click here.